Deputy Mayor Sarabjit Kaur today said that all city residents should contribute in maintaining cleanliness in the city so that Ludhiana becomes leading district of the country in terms of Swachhta. She said this while attending an awareness programme regarding Swachh Bharat Mission and Mission Tandrust Punjab, organised by the Amritsar branch of Field Outreach Bureau of Union Information & Broadcasting Ministry. Mrs Sarabjit Kaur was the chief guest of this function that was organised in Zone C of Municipal Corporation Ludhiana.While speaking on the occasion, she said that the residents should desist themselves from using plastic carry bags so that we can contribute in saving our environment.MC Zone C Zonal Commissioner Mr Jasdev Singh Sekhon, who was the guest of honour, said that under the Mission Tandrust Punjab of the Punjab government, all councillors should organise awareness programmes regarding maintaining cleanliness in their respective wards. He stressed that maintaining cleanliness in city is not just the responsibility of MC, but all city residents should contribute for this cause. Mr HS Aujla, Senior Engineer from MC, urged the city residents to download the Swachhta mobile application in their phones and rank Ludhiana so that it tops the Swachhta rankings. He informed that the Swachhta survey 2019 has started from January 4 onwards and the participation of city residents is of utmost importance.An awareness rally was also organised from Gill Chowk till MC Zone C office. Mr Rajesh Bali, Field Publicity Officer from Field Outreach Bureau was also present on the occasion.A drawing competition regarding Swachhta was also organised at Dashmesh Public Senior Secondary School yesterday and Gurleen won first prize, Sapna won second, Roshni third and Neha won fourth prize. 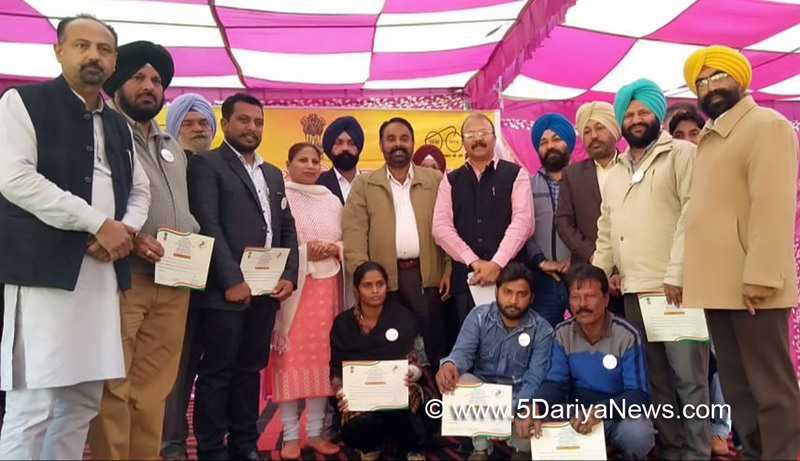 Safai Sewak’s from Zone C, namely Rimpi, Naresh and Mintu, while Sanitary Inspectors Malkiat Singh, Satinderjit Bawa, Mehal Singh and Jagtar Singh were awarded with “Sarvotam Swachhagrahi” certificates by the Union Ministry.